The WRD Board of Directors established the Water Independence Now (WIN) initiative to end the District’s reliance on imported water for groundwater replenishment. WIN is comprised of a suite of projects including expansions to existing water treatment facilities, spreading operations, and stormwater capture facilities. 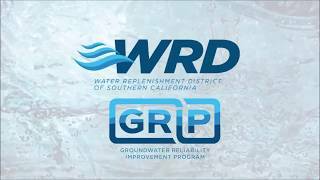 The largest component of the WIN program is the Albert Robles Center for Water Recycling & Environmental Learning (formerly known as the Groundwater Reliability Improvement Project (GRIP)). The purpose of the Albert Robles Center is to fully eliminate the current demand for imported water by producing 21,000 acre feet annually from local alternative sources to replenish the Central Basin. The Albert Robles Center will purify approximately 10,000 acre feet (3.25 billion gallons) of tertiary treated (recycled) water annually to near-distilled levels through an advanced water treatment facility. 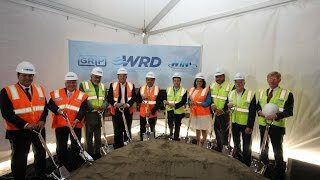 Together, with another 11,000 acre feet (3.6 billion gallons) of recycled water, WRD will deliver 21,000 acre feet of water to the San Gabriel Coastal Spreading Grounds where it will percolate into the Central Basin. The Albert Robles Center is being built on a 5.2 acre property in the City of Pico Rivera, adjacent to the San Gabriel River, allowing for direct delivery of purified recycled water to an existing pipeline leading into the spreading grounds. 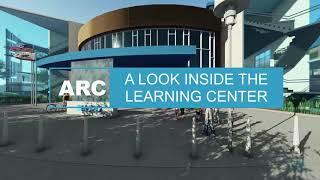 Learn more about the Albert Robles Center! Stay up to date on the Albert Robles Center! The Albert Robles Center for Water Recycling & Environmental Learning AWTF is being built on a 5.2 acre property adjacent to the San Gabriel River in the City of Pico Rivera. Deconstruction of the existing structures on site was completed in spring 2016 and supporting projects including recharge well construction, brine disposal pipeline construction, and street improvements commenced shortly after. Environmental monitoring was conducted throughout the deconstruction process and will continue through all stages of construction. 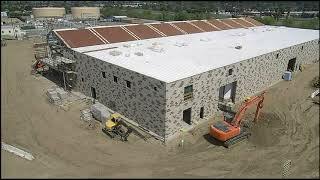 WRD has an agreement with J. F. Shea Construction to complete the design and construction of the GRIP facility. County of Los Angeles Public Health Supports GRIP! Bell Gardens Chamber of Commerce | Bell Gardens Chamber of Commerce, Carlos Cruz, Exec Director | Pico Rivera Chamber of Commerce | Commerce Industrial Council Chamber of Commerce | Los Angeles Metropolitan Hispanic Chambers of Commerce | Cambodian-American Chamber of Commerce |Cambodian-American Chamber of Commerce, Edward Sana Tan, Chairman | Latino Business Association, Ruben Guerra, Chairman | CALASIAN-California Asian Pacific Chamber of Commerce | Los Angeles Area Chamber of Commerce | Long Beach Area Chamber of Commerce | Hawthorne Chamber of Commerce | Los Angeles Business Council | Los Angeles Latino Chamber of Commerce | Chinese Chamber of Commerce of Los Angeles | The Florence-Firestone/Walnut Park Chamber of Commerce | Santa Fe Springs Chamber of Commerce & Industrial League, Inc.